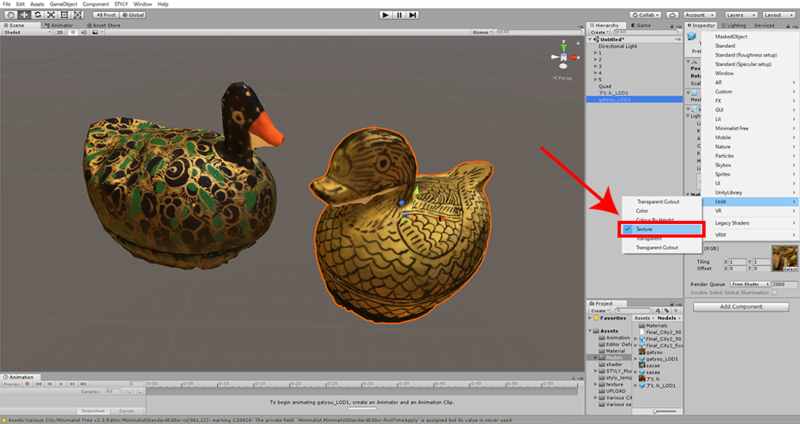 In this article, I explain how to arrange the 3D model imported to Unity with Shaders. By adjusting the shader, you can create various visual effects and make the 3Dmodel look quite different. I also introduce some unique shaders that are useful to create Scenes full of originality. You can taste the sample space in STYLY GALLERY. ※If you have STYLY account, you can view the sample asset created in this article by WebEditor. Shader is ‘a program to define the appearance of an object’. 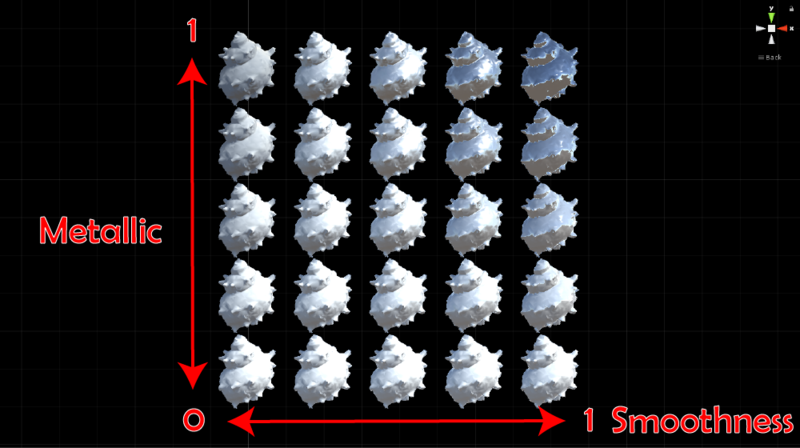 By editing the code of the shader, the appearance of the object changes in various ways. STYLY can import most of Unity’s shaders, so let’s make good use of them to render the world you imagined. Basically, STYLY can import all shaders for Unity. It also supports the shaders designed by node-based visual programming such as ShaderForge (This article explains it in details). However, you cannot use the shader combined with C# script since STYLY cannot import C# scripts. 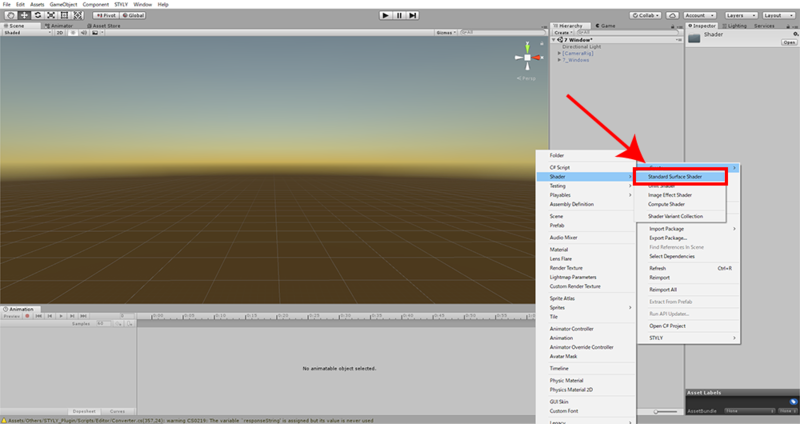 Some shaders in Unity Asset Store include C# script, so please note that STYLY cannot import them. I explain the basics to use a shader. You may skip this chapter if you have already used a shader before. In a shader, there are some parameters to control the appearance such as ‘what texture is used’, ‘how much light is reflected’. It’s a material that defines those parameters. So, when you use a shader on Unity, you need to attach a shader to material and set the parameters, then attach it to the object in the Scene. Firstly, place the 3D model you want to arrange by a shader, in the Scene. In this tutorial, place a ‘Cube’ in the Scene. Right-click on the Hierarchy window and select ‘3D Object > Cube’ to create a Cube object. Place a 3D model in the Scene. Next, let’s create a material. Right-click on the Project window, select ‘Create > Material’ to create it. To avoid confusion, I recommend you to name the material a unique name. I named it ‘New Material 01’ this time. You just need to apply ‘New Material 01’ to ‘Cube’ to change the shader as you like. Drag ‘New Material 01’ in the Project window into ‘Cube’ to attach. Now it’s ready to change the shader. Open the Inspector of the object you attached the material to. Now, you can change the shader by the ‘Shader’ drop-down menu. This drop-down menu also shows newly-made shaders and the ones downloaded from Unity Asset Store, so you can select them from this menu as well. There are several parameters for the material. So, you can change the appearance of the object by adjusting those parameters. When you use the shader with the code published to the internet, you need to define that shader by yourself. It might sound difficult at first, but it’s very easy actually. Firstly, right-click on the Project window, select ‘Create > Standard Surface Shader’ to create a new shader. To avoid confusion, I recommend you to name the shader a unique name. Double-click the created shader to edit its code. Delete all existing codes, and then copy and paste the code of the shader you want to use. When you finished editing the shader, save it and go back to Unity’s screen. The shader created in this way also appears in the ‘Shader’ drop-down menu. There are a variety of unique shaders in Unity Asset Store, so it is also a good idea to use them. A lot of shaders are available for free. 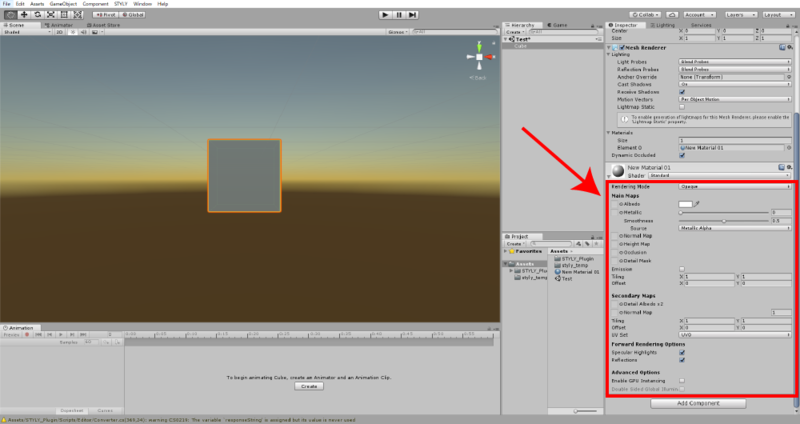 When you use a shader available in Unity Asset Store, you just need to press the ‘Import’ button, which allows you to use it in Unity immediately. 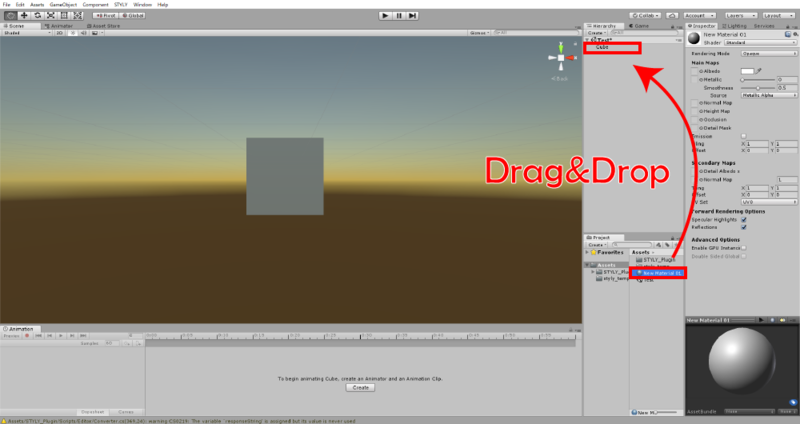 The shader you import in this way also appears in the ‘Shader’ drop-down menu. In this chapter, I explain how to arrange the appearance of a 3D model by modifying the parameters of Unity’s shader. 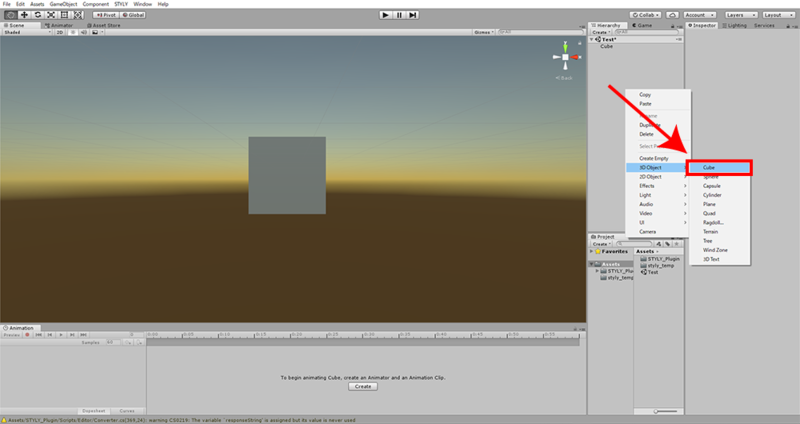 ‘Standard Shader’ is the default shader in Unity. To use ‘Standard Shader’, open the Inspector of the material and select ‘Standard’ from the ‘Shader’ drop-down menu. 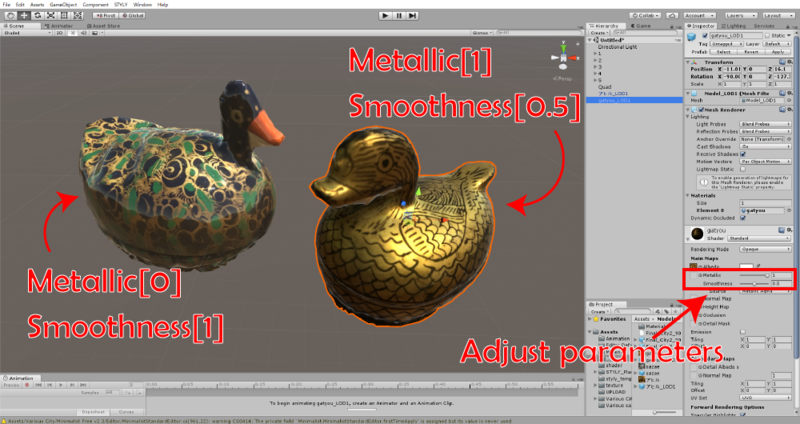 Unity’s ‘Standard Shader’ has some parameters such as ‘Metallic’, ‘Smoothness’, so you can render various textures like plastic or metal. Simply put, the appearance gets more ‘metallic’ by setting ‘Metallic’ closer to 1 while it gets ‘smoother’ by setting ‘Smoothness’ closer to 1. You can arrange the appearance of an object by adjusting those two parameters appropriately. If you want to learn more about the material parameters of Unity’s Standard Shader, I recommend you to read the Official Unity User Manual. Unlit Shader is a shader that doesn’t reflect any light. Since it is not affected by any lights, the object doesn’t cast any shadow. It’s useful to keep the object unaffected by lights or make it look ‘less 3D’ on purpose. It’s also suitable for the 3D model created by photogrammetry. To use ‘Unlit Shader’, open the Inspector of the material and select ‘Unlit > Texture’ from the ‘Shader’ drop-down menu. From now on, I introduce some ‘unique’ shaders useful when you arrange your 3D model. Create a VR work full of originality by making good use of them. It’s a kind of shaders to display the wireframe only, which is introduced in a website, ‘Shaders Laboratory‘. Although there are some other ‘wireframe’ shaders on the internet, this shader gives a tidier appearance since it has a function to remove diagonal lines of the wireframe. ① Create a new shader in the Project window and double-click it to open its code. 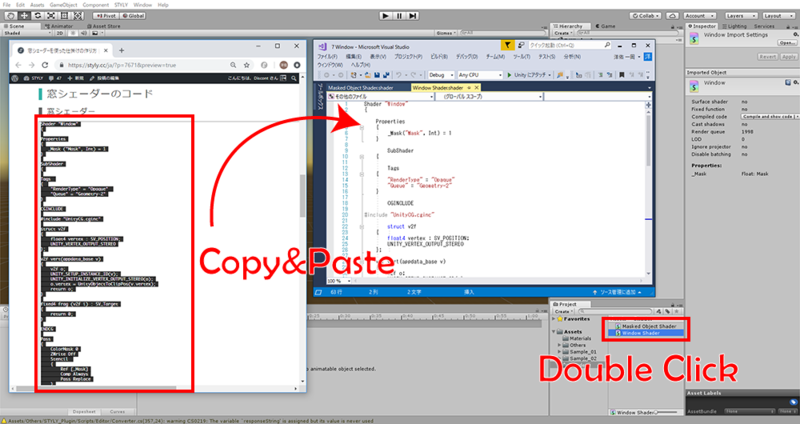 Copy and paste the code shown above into it. ② Create a material and attach it to the object. Select ‘Custom > Geometry > Wireframe’ from the ‘Shader’ drop-down menu in the Inspector. ③ To delete diagonal lines, check the ‘Remove diagonals ?’ item. Wireframe width The width of wireframe Set it to the value between 0 and 0.5. Front colour The colour of the wireframe rendering the front side of the surface. Set the colour you want by the colour dialogue window. Back colour The colour of the wireframe rendering the back side of the surface. Set the colour you want by the colour dialogue window. Remove diagonals? It switches the visibility of diagonal lines. Check it to delete diagonal lines. Gem Shader is a free shader available in Unity Asset Store, which gives a glittering appearance like a jewel to 3D model. 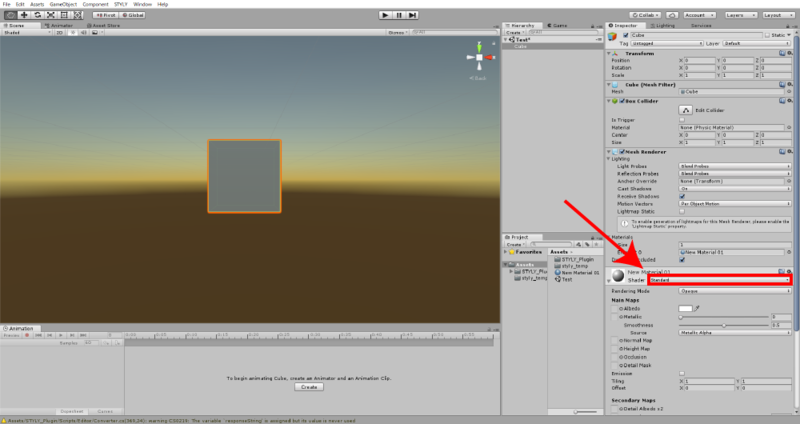 ① Access the page of ‘Gem Shader‘ in Unity Asset Store, and click the ‘import’ button to import the asset. ② In the project window, open ‘Gem > Material’ to find the material. Attach it to the object. color The colour of ‘Gem’ Set the colour you want by the colour dialogue window. Emission The intensity of the light emission from the surface The larger value makes it look more self-light emitting. Minimalist Free is a free shader available in Unity Asset Store. 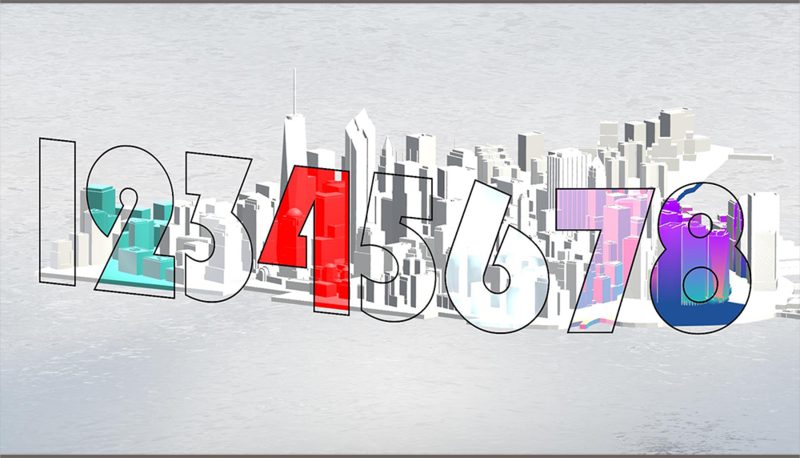 It allows you to apply different colours to six different sides (front, back, left, right, top and bottom). It’s is a shader suitable for the object that consists of cubes and cuboids in particular. 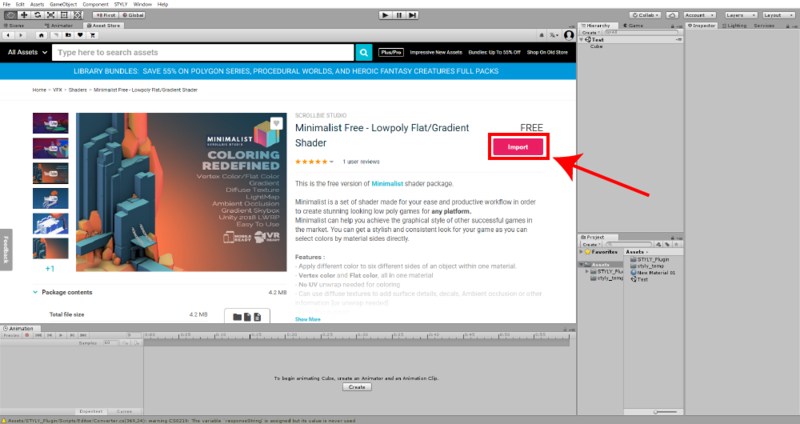 ① Access the page of ‘Minimalist Free‘ in Unity Asset Store, and press ‘import’ button to import the asset. ② Create a material and attach it to the object. Select ‘Minimalist free > Standard’ from the ‘Shader’ drop-down menu in the Inspector. ③ Adjust the parameters as you like. Main Texture The texture to apply to the faces You can specify the texture. Custom Shading/Front The colour of the front face Once you set ‘Shading Mode’ to ‘Solid Color’, you can specify the colour by the colour dialogue window. The free version doesn’t support the gradation function. ‘Colour By Height Shader’ is a free shader available in Unity Asset Store, which applies the gradation in the vertical direction to a 3D model. 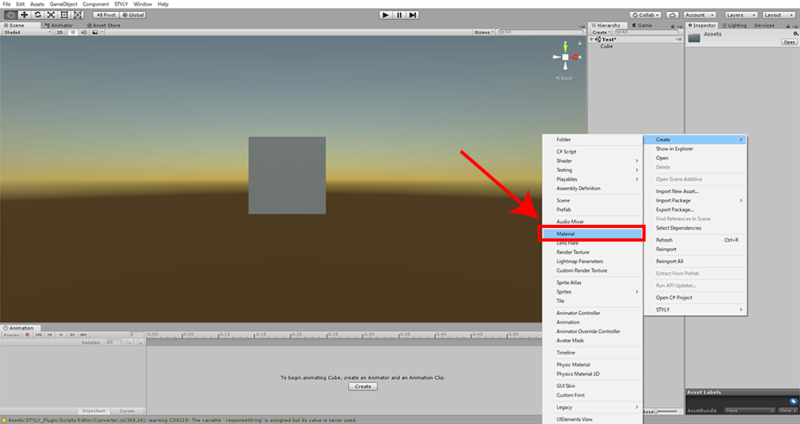 ① Acess the page of ‘Colour By Height Shader‘ in Unity Asset Store, and press the ‘import’ button to import the asset. ② Create a material and attach it to the object. Select ‘Unlit > Colour By Height’ from the ‘Shader’ drop-down menu in the Inspector. (There is also the ‘Lit’ version, which is affected by ambient light. To use it, Select ‘Lit > Flat Shaded Colour By Height’. Highest Point/～Highest The height where the colour starts changing. The gradation of more than two colours doesn’t work in many cases. I am not sure it’s a bug or an expected behaviour by the developer. It’s very easy to import the object attached a shader to into STYLY. All you need it to convert the created object to a Prefab and upload it to STYLY. The appearance of a 3D model changes dramatically by using shaders. There are a lot of interesting shaders, so please find your favourite shader.